Originally proposed in 1892, Christie’s Altazimuth was erected in 1896 as a successor to Airy’s Altazimuth Instrument. Essentially a reversible transit circle, it could be set up to point not only along the meridian, but at different predetermined angles (azimuths) to it. This was achieved by mounting the iron supports of a transit circle onto a circular base which at three points around its circumference rested on a circular casting bolted to the supporting pier. Made by Messrs. Troughton and Simms in nearby Charlton, the telescope had an object glass of 8 inches aperture and 8 feet focal length. Christie’s Altazimuth was never a great success. Seemingly last used in 1929, it was dismantled by Spencer Jones at the start of WW2 and replaced with a small transit instrument that had originally been made for time determinations in Singapore. 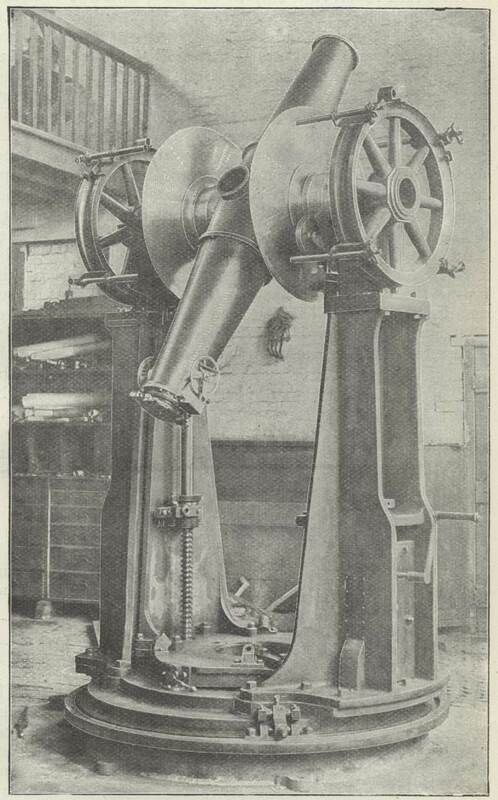 The only part of the instrument known to have survived is the original eye-end which was replaced in 1913 and is now preserved in the collections of the National Maritime Museum (Object ID: AST0880). 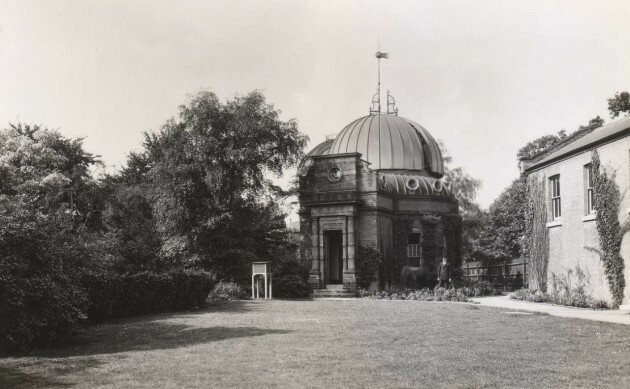 Like its predecessor, the telescope’s main purpose was to make extra-meridian observations of the Moon, especially around the time of New Moon when it was close to the Sun and impossible to observe as it crossed the meridian. From 1923–26, it was also used to make observations in the Prime Vertical (for which it was aligned in an east-west direction) in order to obtain an independent check of declinations given by the Airy Transit Circle. From 1927–29 it was used both as part of an international collaboration to make a series of observations of the Eros reference stars that were to be used while Eros was at opposition in 1930–31, and also for time determination. ‘The New Altazimuth was constructed and erected by Messrs. Troughton and Simms in 1896, but was not brought into regular use till 1899, as it was found that various structural modifications were required particularly in regard to the arrangements for relieving the friction the Y's. This Altazimuth is virtually a reversible transit-circle (of Messrs. Troughton and Simms’ well known form with some improvements), which can be planted in any definite azimuth (say 0º, 45º, 60º, 70º, 80º, 90º E. or W.), and then used for a complete set of observations (including stars for clock and azimuth error) essentially as a transit-circle, giving directly azimuth and zenith distances for the same instant of time. This is arranged by mounting the iron supports of the transit-circle on a circular base resting at three points of its circumference on a circular casting planed on its upper surface. The change from one azimuth to another is effected by turning the instrument about a central pivot on which it is slightly raised, the weight being relieved by friction rollers near the circumference of the circular base. For observations in the meridian, the instrument is used exactly in the same way as a transit-circle. The principle of the method of observing when out of the meridian is to secure observations of azimuth and zenith distance such that the mean of the times is as nearly as possible the same for the two sets of observations. Transits are taken over vertical wires and over horizontal wires so arranged as to secure complete observations in both elements in the different azimuths. The near agreement of the means of the times of transit is obtained by providing in addition to the systems or vertical and horizontal wires (each carried on a micrometer slide) a wire carried by a position circle micrometer which is set before the observation to the approximate inclination of the path of the object to be observed. When the star or other object enters the field the telescope is moved in zenith distance till it is on the position wire; the telescope is then clamped, and the transits are observed across a series of vertical and horizontal wires symmetrically with respect to the centre, as the star moves in its oblique course through the centre of the field, the position wire (which is only used for setting) having been previously moved away from the star. The tube and axis of the telescope are made of phosphor-bronze, the axis and central part of the telescope tube being in one casting. This central part is barrel-shaped (instead of being in the form of a cube as in the transit-circle), and is stiffened inside by diaphragms so as to minimize flexure of the axis. A clear aperture of 6 inches diameter is made in it on each side, to admit of one collimator being viewed by the other when the telescope is in a vertical position. 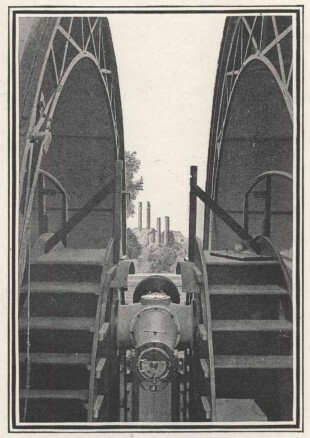 The two portions of the telescope tube, which are exactly alike and are slightly conical, are bolted to the central casting. Two zenith distance circles are provided, one of which is fixed while the other can be turned on the axis and, by means of a clamp and slow motion, fixed in any position, so that it may be made available for the determination of division errors by comparison of corresponding angular intervals on the two circles. These circles are discs of phosphor bronze 3 feet in diameter, the divisions being on thin bands of palladium silver alloy let into the face of the bronze discs. The pivots are of steel, and of 6 inches diameter. They rest on segmental bearings of bell-metal. The weight of the instrument on the Y's is relieved by live rings (ball bearings) round the axis, suspended freely by strong springs carried by the iron supports of the instrument, an arrangement which was substituted with success for the friction­rollers with upward thrust, originally supplied, as these were found to cause torsion in the axis and bearings. Each circle is read by four microscopes. To carry the microscopes two broad wheels made of bronze are fixed to the iron supports of the instrument, the centres of the wheels being in the axis of the telescope. These wheels are screwed to the iron supports and are in addition pinned near their centres to prevent any possibility of movement. As previously stated the instrument is reversible in its Y’s. The counterpoise springs with the live rings are carried by the reversing gear during reversal so as to avoid: the necessity for removal and readjustment of these springs. Another form of reversal of the instrument is obtained by turning it through 180º in azimuth, so that there are in all four essentially different positions in which it may he used. The object glass is of 8 inches aperture and 8 feet focal length. The full aperture is always used. The magnification employed is 168 for stars, and 180 for the Sun. 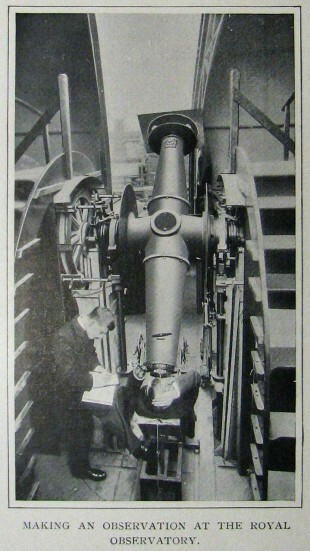 The instrument is provided with two collimators in the meridian, each of 6 inches aperture and of 69 inches focus. 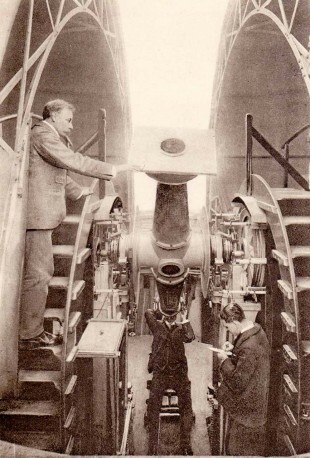 They are each mounted on two pairs of parallel arms (counterpoised) turning about centres below, so that they can be brought up into the position for observation, or lowered to be clear of the telescope and dome, when they are housed under hinged flaps. The situation of the Altazimuth is about half-way between the Old Observatory and the New Building. Its exact position relative to the centre of the transit-circle is 141 feet (= 0s.15) E. and 166 feet (= 1”.67) S. It is mounted on a pier of concrete, 20 feet above the ground and has a clear view all round. This pier, which is quite clear of the observing floor, rises from a large concrete foundation, 6, feet deep, on which the whole building rests. The dome is built in two halves which can be opened to a clear width of 4½ feet, and is capable of rotation, so that the opening may be in any required azimuth. In 1910/11, a new mercury trough for taking observations by reflection was fitted and in 1913 a new eye-end was installed. In the early 1900s, the London County Council began building a power station on the south bank of the Thames to the north of the Observatory. Its alignment was such, that one of the four chimneys straddled the Meridian of the Altazimuth Telescope. Apart from the issue of smoke, there was also the issue of turbulence caused by the hot gases rising from the chimneys. Christie and his Board of Visitors appear to have been asleep on the job and were seemingly unaware of what was being built until the power station was well advanced, at which point they made a big fuss which was picked up by the press. That was in 1906. As a result of an intervention by the Admiralty, the two southern chimneys, which were the ones that most affected the Altazimuth Telescope, were reduced in height, thereby mitigating their negative impact. Click here to read more about the power station and its impact on the Observatory. 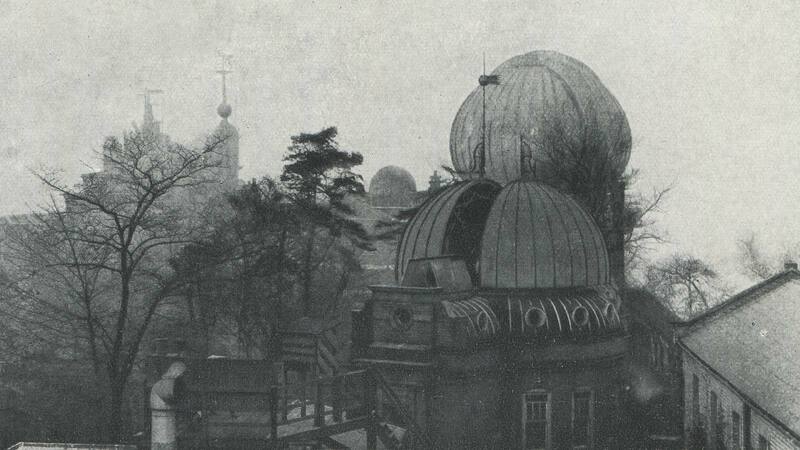 Observations made with the instrument were published in Greenwich Observations. The results of the observations made in the Prime Vertical were published separately in 1928 under the title: Declinations of Stars derived from Observations of Transits in Prime Vertical with the Altazimuth in the years 1923–1926. In addition, each of the Annual Reports from 1897–1929 contain both a description of any issues that arose with the instrument during the reporting year, together with an outline of the year’s observing programme. RGO7/34 contains two black and white photographs of the New Altazimuth Instrument, one of which is in good condition and the other in poor condition (faded and spotted).